Connecting your audio platforms makes it easy to export Mixlr recordings so your followers elsewhere can hear your broadcasts if they missed the live show. You can also link your Facebook account to Mixlr so you can log in easily without needing to enter your details each time. This article will show you how to link your audio streaming and social media platforms to your Mixlr account. To add your audio streaming and social media credentials to your Mixlr account go to your Profile page. Scroll down the page to the My Connections section and click the 'Add/Edit/Remove' button. This will open the My Connections window. 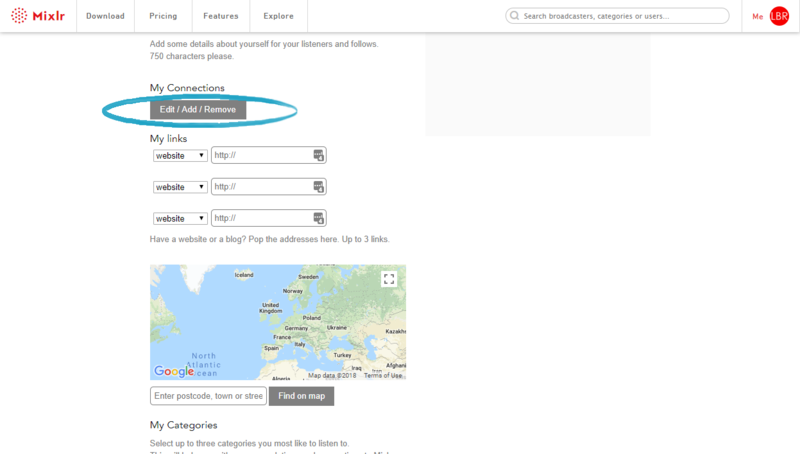 From here you can add your account credentials for SoundCloud, Facebook, Twitter, Dropbox, Audioboo (Audioboom) and Mixcloud by clicking the 'Connect' button for the relevant service. 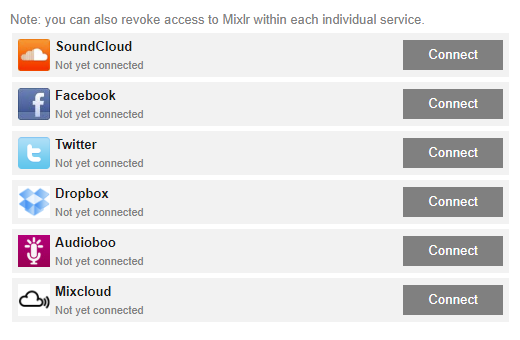 TIP: after adding each service you'll have the option to disconnect it from your Mixlr account at any time. Find out how to export your recorded broadcasts to other platforms here.